"YES Frank! 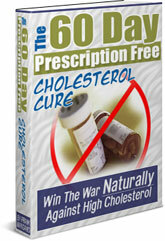 I Want To Lower My Cholesterol With Your 'Mangano' Method! Give Me My Copy Of Your Electronic Manual For Just $5! I Realize I'm Totally Protected By Your Iron-Clad Guarantee!" I can't wait to download and read your electronic guide and put it to use immediately to lower my cholesterol naturally. I understand I'm offered a No-Risk, 60 Day Money Back Guarantee. I further understand that online ordering is very safe. I will connect to ClickBank through a secure server, which makes it virtually impossible for anyone to intercept my information. Once I enter my payment and credit card information, my credit card is validated and I will be taken to a web page which has the download information. I can then easily click on the file and download it to my own computer. If you’re really serious about changing your life, I’ve got an upgraded package for you. In addition to my cholesterol e-book and all the bonuses, you'll also receive my best selling e-book The Blood Pressure Miracle for just $5 more! Upgraded Order For Just $10! 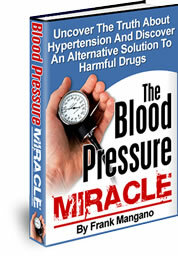 NOTE: The Blood Pressure Miracle , The 60 Day Prescription Free Cholesterol Cure and all the bonus material are downloadable e-books. No physical products will be shipped. After you order, you will get INSTANT ACCESS to download the e-books onto your computer. The e-book format is adobe acrobat PDF, which can be viewed on Mac or PC.